Today is both the Carnival of Homeschooling (at MrsMamaHen.com) and the Charlotte Mason Blog Carnival (at Epi Kardia). 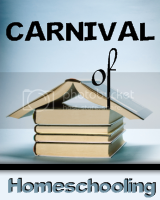 Ha, I still have the CM Carnival page from two weeks ago up on my browser so it will be handy in case I get a few minutes to peruse it. I haven't gotten through it yet! Today they've also announced the winners of the Homeschool Blog Awards over at The Homeschool Post. You might remember the "4 Moms, 35 Kids" series I mentioned a while back. They've been continuing that for some time and I've been sort of following it (with maybe slightly more success than I've had at following the CM Carnival), but I'm trying to catch up and hope to provide more links for that later. Last Thursday the topic was Thanksgiving ideas, so some people might want to check that out this week. I only linked to Raising Olives' post. You should be able to get to the others from there, but the tips people posted will show up on any of their blogs. There's always far more to read than can ever be read by one person, both in books and in blogs. "Of making many books [and blogs] there is no end" -- slightly modernized partial reference to Ecclesiastes 12:12. I can be thankful that I'll probably never run out of something to read!